Project obstacles and solutions: The Indianapolis Cultural Trail is an initiative that has redesigned parts of the urban landscape and made it more eco-friendly. Among the projects was a redesign of bus stop shelters along the trail. 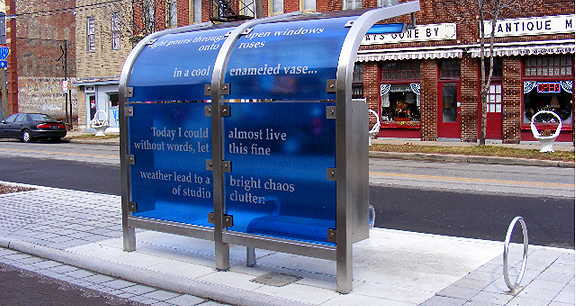 Architect Donna Sink designed a series of shelters that incorporated poetry printed on curved ecoresin panels that would reflect onto a concrete base that is made with photocatalytic cement. Photocatalytic cement has been used over the past decade as an architectural element, but is a relatively new product in promoting sustainable concrete. It uses sunlight to accelerate oxidation which breaks down both organic and inorganic pollutants. Normally concrete will become gray as it ages because there is a buildup of pollutants on its surface. Concrete designed with photocatalytic cement is self-cleaning, neutralizing pollutants, and remains white. Hunt Paving poured three yards of concrete for each shelter. They turned to IMI Technical Services to produce a mix design that would meet the tight specifications needed for this job. IMI produced a Class A mix using a high dosage of TX Active Photocatalytic Cement from Essroc. The photos show the contrast between the white photocatalytic slab and the concrete block surrounding the shelter. There are a total of four shelters built along the Cultural Trail. For more information on concrete mixed with photocatalytic cement, contact one of our sales reps. Click here.